An official EA poster claims that the company isn't working on The Sims 5 at all, and its very existence hinges on the success of The Sims 4. Grass grows, birds fly, and EA releases a new The Sims title every few years. It is, after all, one of the best-selling franchises of all time. But, that may cease to be the case if its latest effort, The Sims 4, is not successful. Posting on EA's official forums, The Sims producer SimGuruGrant stated that the team isn't even thinking about The Sims 5, and won't even consider it if it isn't happy with The Sims 4. "We're not working on Sims 5," posted Grant, in response to a fan's suggestions on what to include in the next title. "We're not thinking about Sims 5. If Sims 4 isn't successful, there won't be a Sims 5." A lot of fans have been criticizing EA and Maxis for some rather unpopular decisions it made with The Sims 4, and reception to the game's release has been somewhat negative. Grant and Maxis insist that they are dedicated to the game for the long-run, and that they won't just abandon it in favor of another sequel, but EA's track-record of doing this exact thing with its other franchises is not exactly stellar. 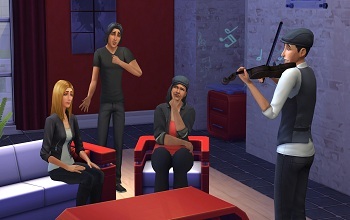 Hopefully, Maxis will actually stick to its word and turn things around with The Sims 4.